As a child, Gabrielle Hamilton fondly remembers the grand parties her parents used to throw and the luscious dishes her mother would prepare in the family kitchen. It was the very foundation for her love of food. This of course, was all before her family fell apart and Gabrielle spent many years adrift, trying to figure out what she wanted to do with her life. Feeling like the kitchen was the place she most belonged, after getting her MFA in creative writing at the University of Michigan, Gabrielle moved back to New York City and stumbled upon the opportunity open her own restaurant. But having never been a chef, let alone the owner of her own business, she wondered if opening a restaurant in one of the most breakneck cities in the world was a fool's errand. 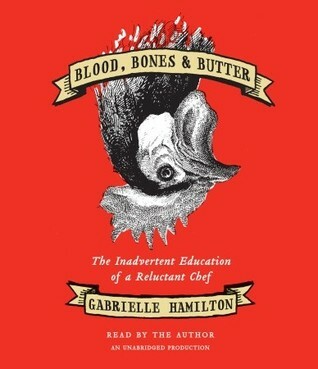 I don't often say this about writers because in general I find them to be wonderful people, but Gabrielle Hamilton comes off as such a self-important snob that it was difficult to stomach listening to her drone on in this audiobook. Since I am a teacher, I try to refrain from using expletives in my public online persona, but I am curbing an intense desire to swear while writing this review. I don't like to write negative reviews. I write critical reviews, but negative I try to steer clear of. I can't steer clear of being negative in this review because Gabrielle Hamilton made it personal. Here is someone who is so uppity that she had the audacity to describe people Ann Arbor as unsophisticated (if you live in Michigan, you know what a slap in the face this is since if people from Ann Arbor are accused of being anything it's pretentious and snobby) and then uses the euphemism "Harvard of the Midwest" to describe The University of Michigan in a painfully condescending tone. Her basis for her assessment of Ann Arborites? The fact that she wasn't able to cater events with Russian Imperial table service like she did in New York and also because everyone in the city wears maize and blue. IT'S A COLLEGE TOWN! Ever hear of a little thing called school spirit Ms. Hamilton? Basically anything Midwestern she appeared to find reviling and too "down home" for her tastes. So sorry we're not sophisticated enough for you here in the Midwest Gabrielle. In addition, I thought her pompous and downcast attitude toward her colleagues in the MFA writing program at U of M was rather presumptuous and insolent given the fact that she frequently described herself as feeling like she didn't fit in with the group of writers because she didn't know the vernacular. Despite admitting to not knowing what the word trope meant (a word even my unsophisticated self from Michigan could figure out in college using CONTEXT CLUES), I'm a little confused by her brazen attitude that she is the superior one just because she's from New York. I honestly considered abandoning this audiobook prior to the section on her move to Ann Arbor. I couldn't take her insipid attitude and monotone narrating, but once I realized she'd be writing about a place that is close to my heart, mere minutes from where I live, I decided I wanted to hear what she had to say. All I can say is that you just messed with the wrong reader Ms. Hamilton. I am a proud Michigander and I will let no review go unscathed that befouls the name of people who live in it. But insults to Michigan aside, this book was just odd. When writing about food, Hamilton is a master. She manages to help us see her passion and talent when describing those dishes that allow her to reminisce about the past. When it comes to writing about her personal life however, it was awkward and uncomfortable. All of her personal relationships are bizarre at best, dysfunctional at worst. The basis for which she married her husband alone is strange enough, but then continuing to live apart despite having two children together? She honestly gave me nothing for which I could empathize with her. But maybe that's just because I'm an unsophisticated Michigander who doesn't understand the complicated lives of cosmopolitan New Yorkers. The audiobook is narrated by Hamilton herself and this made it yet another reason to dislike the book. Her style of narration was so deadpan and monotone that this only enhanced and emphasized her unlikeability - it was like she had no emotion whatsoever. There wasn't a shred of humor or lightheartedness in her voice; it may as well have been narrated by a robot. If you're looking for a heartfelt, feel-good memoir, put this one back on the bookshelf. If you're someone who enjoys watching a trainwreck, perhaps this is the book for you. This is a wonderful review - it sounds like the author is actually crazy, and I too want to bristle at the insults to Michiganders you have mentioned. Ann Arbor is a town that I feel is kind of pretenious, as you said - they are the kind of people who like organic food and would only buy it at Whole Foods. ;) Not that there is anything wrong with that, I shop there too. I live 10 minutes from Detroit and I have found some amazing spots to frequent, like The Sugar House Bar in Corktown. But then again, I am probably unsophisticated as well. I will probably read this book, I like trainwrecks. i haven't read this one yet but it's on my list of books to read. i kind of love the cover and title. but your review makes me think it might not be great. i'll still give it a chance but i pretty much can't stand snobbery of any kind so i may have the same feelings as you. thanks for the review!